1892 1:500 OS map. The first Manchester Road (or Thorneybank) passenger station closed in 1866 and has been demolished, and its replacement is on the opposite side of the road bridge. 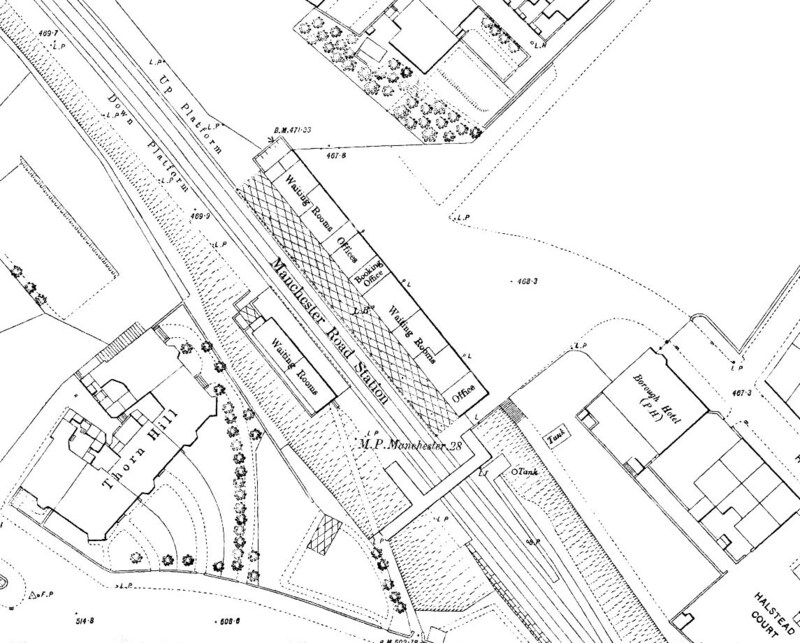 However the goods traffic continues to be handled at the first site, and certain improvements have been made, including a double-track chord to provide direct access towards Todmorden from the warehouse beside the canal, but access to the goods shed’s single track is still via wagon turntables. The engine shed is no longer named, and a signal box has been built close to it. The second Manchester Road station has two facing platforms, and the main passenger facilities are on the up side in a lengthy building whose internal functions are shown on this large scale plan. A verandah (indicated by cross-hatching) extends over the platform from the building. On the down platform the building contains two waiting rooms and a gentlemen’s toilet, whose glazed roof is shown. Vehicular and pedestrian access to the forecourt and main building is via Halstead Street, and from Manchester Road pedestrians can reach the down platform and the footbridge.